Chinese mobile maker ZTE has announced plans to sell a smartphone running the Mozilla Foundation's Firefox OS worldwide via online auction site eBay. 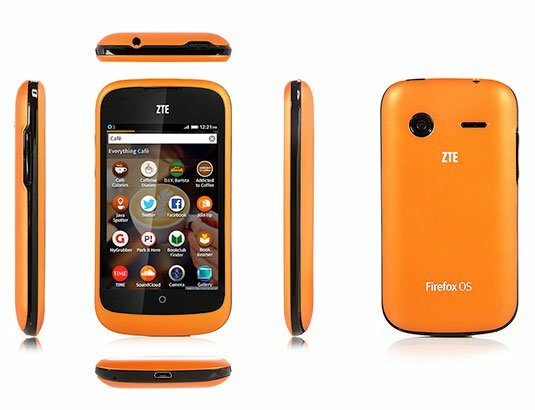 The company said the orange-colored version of the ZTE Open would go on sale "soon" for $79.99 on eBay's US site and £59.99 in the UK, though no specific date was given. "The ZTE Open offers customers a smartphone experience at an incredible price point, making it ideal for cost conscious consumers or those looking to upgrade to a smartphone for the first time," ZTE vice president Dai Wenhong said in a statement. Naturally, that low price tag won't get you a flagship device. In fact, by most smartphone platform standards, the ZTE Open's hardware specs are rather modest. It's based on a Qualcomm Snapdragon MSM7225A chip, which includes a single 1GHz Cortex A5 processor core and an Adreno 200 GPU. It comes with 256MB of RAM and 512MB of internal storage, expandable via microSD cards. It has a 3.5-inch multitouch screen with 480-by-320 pixel resolution. It includes a 3.15MP rear-facing camera, an accelerometer, and an ambient light sensor, and it can pull in 802.11a/b/g/n, Bluetooth 2.1, GPS, and FM radio. And that's about it. With specs like those, the ZTE Open is hardly going to give the next iPhone a run for its money. But based on early reports, it does an adequate job of running Mozilla's lightweight, HTML-based Firefox OS, which is only just beginning to trickle out into mobile markets worldwide. Telefónica launched the ZTE Open in Spain on July 2, and Deutsche Telekom followed shortly thereafter in Poland. The carriers have since debuted the device in other regions, including Venezuela and Colombia. Mozilla has positioned Firefox OS as a low-cost alternative to platforms like Android and iOS, particularly for developing markets where many customers are only just making the transition from low-end feature phones to smartphones and the mobile web. The version of the ZTE Open that will sell through eBay will be fully unlocked, so it should work on most mobile carriers worldwide. According to a blog post from Mozilla, it will not be optimized for specific networks and it will include no local or carrier-specific apps or features. On the other hand, well-heeled Firefox fans who can't stand the thought of using low-end hardware might look elsewhere. Spanish startup Geeksphone is accepting preorders of the Peak+ – a Firefox OS handset with a better processor than the ZTE One's, a better screen, more storage, and dual cameras – for €149 ($198/£128) for a limited time.